China consists of 23 provinces, 5 autonomous ethinic regions, 4 municipalities directly under the central government , 2 special administrative regions and 1 independent province (Taiwan),at the first level,i.e. provicial level, 333 municipalities and prefectures at the second level, also referred to as prefectural level, and 2,856 counties, cities and districts at the third level,i.e. county-level, as well as over 40,906 towns, townships and sub-districts at the fourth level (township-level). All that can be traced on this website. .
China, [in Chinese "中国"], the Chinese characters means "Central Country". China,(People's Republic of China), is situated in eastern Asia, bounded by the Pacific in the east. The third largest country in the world, next to Canada and Russia, it has an area of 9.6 million square kilometers, or one-fifteenth of the world's land mass. It begins from the confluence of the Heilong and Wusuli rivers (135 degrees and 5 minutes east longitude) in the east to the Pamirs west of Wuqia County in Xinjiang Uygur Autonomous Region (73 degrees and 40 minutes east longitude) in the west, about 5,200 kilometers apart; and from the midstream of the Heilong River north of Mohe (53 degrees and 31 minutes north latitude) in the north to the southernmost island Zengmu'ansha in the South China Sea (4 degrees and 15 minutes north latitude), about 5,500 kilometers apart. There are 6,536 islands larger than 500 square meters, the largest is Taiwan, with a total area of about 36,000 square kilometers, and the second, Hainan. The South China Sea Islands are the southernmost island group of China. POPULATION: Total Population 13.5 billion (2010) about 22% of total population in the world. The year of 1998 saw 19.91 million births, 8.07 million deaths of the population, with a net growth population of 11.84 million (compared with 12.37 million in 1997); More than 10% of total population is over 60 years old (1999 data). China population is distributed unevenly with more in the east (more than 300 persons per square kilometer) and fewer in the west (about 40 persons per square kilometer. The national average density of population is 119 per square kilometer (1990 census). The average size of household was 3.7 persons. The proportion of population aged at 0-14 was 26.4 percent, those aged 15-64 was 67.2 percent, and that of the people aged 65 and over was 6.4 percent. The Average Chinese Life-Span of the population was 70.8 years, that for male was 68.71, and female, 73.04. (Some of the above data are based on the report from China National Statistics Bureau, FOR YOUR REFERENCE ONLY). The national flag of China was adopted at the First Plenary Session of the Chinese People's Political Consultative Conference held in September 1949, shortly before the founding of the People's Republic of China. The flag of the People's Republic of China is red in color and it has five yellow stars. The color red symbolizes the spirit of the revolution, and the five stars signify the unity of the people of China under the leadership of the Chinese Communist Party. The flag first went up in Tiananmen Square on October1, 1949, upon the formal announcement that People's Republic of China was founded. The design of the national emblem of the People's Republic of China, published by the Central People's Government on September 20, 1950, shows Tiananmen under the light of five stars, and it is framed with ears of grain and cogwheel. Tiananmen is the symbol of modern China because the May 4th Movement of 1919, which marked the beginning of the new-democratic revolution in China, was launched there. It is also the place where the inauguration of the People's Republic of China was held. The cogwheel and the ears of grain represent the working class and the peasantry respectively, and the five stars symbolize the solidarity of the various nationalities of China. The emblem clearly indicates that People's Republic of China is a socialist state led by the working class and based on the alliance of the workers and the peasants. The words for the national anthem were written by Tian Han, and the music was set by Nie Er in 1935. Originally known as the March of the Volunteers, it was the theme song of The Sons and Daughters in Times of Turmoil, a film that depicted how Chinese intellectuals marched bravely to the front in the War of Resistance Against Japan during the Second World War. Sonorous, militant and inspiring, the song describes the wrath of the Chinese people against imperialist aggression and their determination to protect their motherland against foreign, invaders. During the Second World War it was also sung by people of other countries who sympathized with the Chinese people in their anti-Japanese struggle. In 1949 it was appropriately chosen to be the national anthem of the People's Republic of China. HISTORY: China, one of the four oldest civilizations in the world, has a written history of 4,000 years and boasts rich cultural relics and historical sites. It is the inventor of compass, paper-making, gunpowder and printing. The Great Wall, Grand Canal and Karez irrigation system are three great ancient engineering projects built 2,000 years ago. Now they are the symbols of the rich culture of the Chinese nation. China has gone over a long history of primitive society, slavery society, feudal society and semi-feudal semi-colonial society and the present socialist society. Chinese Dynasties and Chinese Historic Relics. Little was known about the low-profile Mr Hu when he was elected by the National People's Congress in March 2003. President Hu Jintao, said to be cautious and loyal to the party His position as the presidential heir-apparent had been cemented at the 16th Communist Party Congress in 2002, when he succeeded Jiang Zemin as head of the party. He was re-elected as president in March 2008. Mr Jiang's decision to stand down as head of the powerful Central Military Commission in 2004, three years earlier than planned, was said to have completed the first orderly transition of power since the communist revolution in 1949. Mr Hu has made the fight against corruption a priority; he has promised to promote good governance, saying the fate of socialism is at stake. But he has rejected Western-style political reforms, warning that they would lead China down a "blind alley". Responding to rising social tensions and China's wealth gap, he advocates a drive to build a "harmonious society" and has promised greater spending on health and education in rural areas. Mr Hu is scheduled to retire as head of the Communist Party in 2012 and as president in 2013. Vice-President Xi Jinping is seen as a likely candidate for the succession, especially after being appointed vice-chairman of the Central Military Commission, which is regarded as a key stepping stone to the top job. Hu Jintao was born in Anhui province in 1942, according to his official biography. A committed Communist Party member since 1964, his party career took off in the late 1970s. In the 1980s he served as party chief in Guizhou and Tibet, where he oversaw crackdowns on pro-independence protests. In 1992 Mr Hu became the youngest member of the Politburo Standing Committee, the party's main decision-making body. He is said to enjoy dancing and table tennis and has been described as a cautious, intelligent man. Party loyalty and obedience are believed to have contributed to his political rise. The working days are from Monday to Friday. Most people do not work on weekend. Official hours are from 8:00am to 17:00pm with one hour for lunch. LANGUAGES: The national language is Putonghua (the common speech) or Mandarin, which is one of the five working languages at the United Nations. Most of the 55 minority nationalities have their own languages. 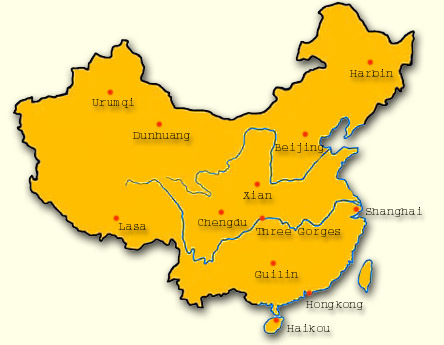 Cantonese is one of the local dialects of southern China. As a written language, Chinese has been used for 6,000 years. NATIONALITIES: The People's Republic of China is a unified, multi-national country, comprising 56 nationalities. The Han people make up 91.02 percent of the total population, leaving 8.98 percent for the other 55 ethnic minorities. They are Mongolian, Hui, Tibetan, Uygur, Miao, Yi, Zhuang, Bouyei, Korean, Manchu, Dong, Yao, Bai, Tujia, Hani, Kazak, Dai, Li, Lisu, Va, She, Gaoshan, Lahu, Shui, Dongxiang, Naxi, Jingpo, Kirgiz, Tu, Daur, Mulam, Qiang, Blang, Salar, Maonan, Gelo, Xibe, Achang, Pumi, Tajik, Nu, Ozbek, Russian, Ewenki, Benglong, Bonan, Yugur, Jing, Tatar, Drung, Oroqen, Hezhen, Moinba, Lhoba and Gelo. All nationalities in China are equal according to the law. The State protects their lawful rights and interests and promotes equality, unity and mutual help among them. FAMILY NAMES: Chinese family names came into being some 5,000 years ago. There are more than 5,000 family names, of which 200 to 300 are polular. The order of Chinese names is family name goes first, following by given name. For instance, the family name of a person is Wang, given name is Dong, his/her full name would be Wang Dong . The most popular Chinese family names are LI, ZHANG, WANG, LI, ZHAO, LIU, CHEN. According to the most recent official statistics, the three most popular family names are: LI, WANG and ZHANG, occupied 7.9% (97million), 7.4 and 7.1 of total population in China respectively. RIVERS: China has 50,000 rivers each covering a catchment area of more than 100 square kilometers, and 1,500 of them cover a catchment area exceeding 1,000 square kilometers. Most of them flow from west to east to empty into the Pacific Ocean. Main rivers include the Yangtze (Changjiang), Yellow (Huanghe), Heilong, Pearl, Liaohe, Haihe, Qiangtang and Lancang. The Yangtze of 6,300 kilometers is the longest river in China. The second longest Yellow River is 5,464 kilometers. The Grand Canal from Hangzhou to Beijing is a great water project in ancient China. It is of 1,794 kilometers, making it the longest canal in the world. RELIGIONS: China is a multi-religious country. Buddhism, Taoism, Islam, Catholicism and Protestantism, with the first three being more wide spread.Various religions exert different influence on different ethnic groups. Islam is followed by the Hui, Uygur, Kazak, Kirgiz, Tatar, Dongxiang, Salar and Bonan nationalities; Buddhism and Lamaism are followed by the Tibetan, Mongolian, Dai and Yugur nationalities; Christianity is followed by the Miao, Yao and Yi nationalities; Shamanism is followed by the Oroqen, Ewenki and Daur nationalities; the majority Han nationality believes in Buddhism, Christianity and Taoism. TOPOGRAPHY: With a broad area, China's topography is very complex. The outline descends step by step from the west to the east. Mountains and hilly land take up 65 percent of the total area. There are five main mountain ranges. Seven mountain peaks are higher than 8,000 meters above sea level. The Bohai Sea, East China Sea, Yellow Sea and South China Sea embrace the east and southeast coast. MONEY: Chinese Money is called Renminbi (RMB) (means "People's Currency"). The popular unit of RMB is Yuan. The official exchange rate between U.S. Dollar and Renminbi Yuan currently is about 1 : 8.3 (1.00 Dollar = 8.30 Yuan). 1 Yuan to 10 Jiao, 1 Jiao to 10 Fen (There are parts of China the Yuan is also known as Kuai and Jiao is known as Mao. Chinese currency is issued in the following denominations: one, two, five, ten, fifty and a hundred Yuan; one, two and five Jiao; and one, two and five Fen. CIVIL ELECTRICAL POWER: AC 220 V, 50 Hz (bathrooms of many luxury and medium-grade hotels may have 110-volt sockets).